One of the commenters on our very first post wanted to hear more about the Large Synoptic Survey Telescope (LSST), one of the three cosmological projects that involve Brookhaven Lab. 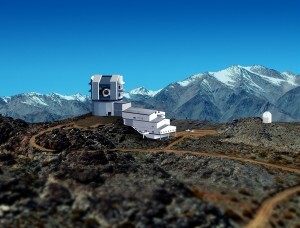 Set high on a mountaintop in Chile, LSST will be a very big and expensive ground-based telescope. Planning for the project started near the end of the 20th century and the experiment probably won’t start taking data in a scientific manner until 2020. The story is that at a decadal survey 10 years ago, the person who first proposed that the word “synoptic” be used in the project’s name had a misunderstanding about what synoptic really means. Either way, the name has stuck. Synoptic, by the way, comes from Greek word “synopsis” and refers to looking at something from all possible aspects, which is precisely what LSST will do. Astronomical survey instruments fall broadly under two categories: imaging instruments that take photos of the sky, and spectroscopic instruments that take spectra (that is, distribution of light across wavelengths) of a selected few objects in the sky. LSST falls into the first category — it will take many, many images of the sky in the five bands, which are a bit like colors, from ultra-violet light to infrared light. What’s special about LSST is the amazingly large field of view and cadence. The field of view of LSST is the size of the sky that it can observe at the same time and is about 3.5 degrees in diameter. You could fit the Moon seven times across this large field of view. This, of course, means that if you want to have great detail in these images, you need a lot of pixels. 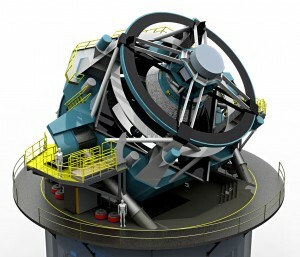 The LSST camera will have resolution of 3200 megapixels, about a thousand times more than an average consumer camera. LSST will take a new image of the sky every 20 seconds: a 15-second exposure followed by 5 seconds spent moving on to the next position and reading out the data. This is a very long exposure when compared to taking photos at a birthday party, but by astronomical standards, it is a very short amount of time. Typical cosmological exposures usually last between 15 minutes and 2 hours. We refer to the ability of LSST to take many images quickly as high cadence of the telescope. The requirements for the telescope’s high cadence and large field of view puts very-hard-to-reach technical demands on the design of the camera — this is something that our colleagues in Brookhaven’s Instrumentation Division work on night and day. But the hard work will pay off: it will allow us to survey the entire southern sky in two bands in two days, something unheard of in astronomy so far. So, what will come out of LSST? As an instrument, the telescope will simply provide us with very detailed images of the entire southern sky every couple of days. These images can be analyzed separately for things that go “BANG” and disappear, or combined into a single deeper image where even fainter objects will appear. A wide range of science can be done with such data: from mapping near-earth asteroids and performing solar system, galactic and stellar science all the way to determining the distribution of dark matter. Basically, once you have detailed images of the sky, you can do pretty much any astronomy you want. The U.S. Department of Energy, Brookhaven’s primary funder, has a particular interest in dark energy — a mysterious force that is key to understanding why our universe is expanding at an ever-increasing rate. I will tell more about this in an upcoming post.